So 1-2 months put the head unit at an October or November ballpark. Well, at least Alpine says they will announce the date shortly. Hopefully, they will be able to keep up to the promised date, unlike Pioneer. The Alpine head unit is rumored to be the iLX-007 which features a 7-inch capacitive touchscreen. The double-DIN receiver reportedly won't feature a DVD drive or Bluetooth and measures only about 3-inches in depth. 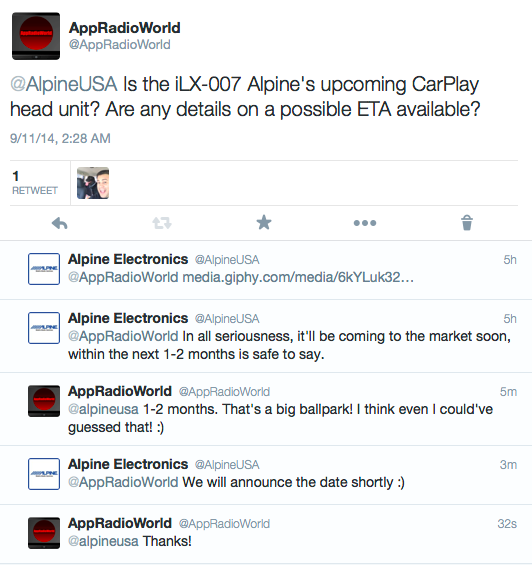 None of this has been confirmed by Alpine yet. In the initial stages when Apple announced Pioneer and Alpine to be its aftermarket partners for CarPlay, Alpine came out and said their CarPlay head unit would be priced somewhere between $500-$700. I seriously doubt whether that price point will be appealing to customers for a double-DIN receiver that does only CarPlay and AM/FM radio. I mean, for that price you can get a Pioneer head unit that does a lot more than just CarPlay (albeit, CarPlay is not available yet). Apple has already said that more third-party apps will be added to the CarPlay catalog in the future. In a perfect world, I wouldn't mind having a double-DIN stereo that does only CarPlay and nothing else. It should ideally be priced between $300-$400. But that's just my opinion. If I understand the meaning of the word "shortly" correctly, we should hear about Alpine's CarPlay head unit in the next couple of weeks or so. But then again, didn't we all think "early summer" meant early summer for Pioneer? CarPlay release has been a big mystery so far and unless we see it in the wild, its best not to believe any estimates. iOS 8 drops on September 17. It will be interesting to see if CarPlay functionality gets any upgrades in the coming months in iOS 8.